SouthBound Bride is aims to feature the very best of South African weddings and ideas, and we love receiving your submissions! Please read through the following guidelines carefully to give your work the best chance of being accepted for publication. You can also submit directly to SBB using the links below. Who can submit real weddings and shoots for publication? In all cases, we’d prefer to receive submissions from the photographer directly. However, we do also accept submissions from planners and brides. Please ensure that you have the photographer’s permission to submit. What is your exclusivity policy? SouthBound Bride operates a semi-exclusive editorial policy. Other than in exceptional circumstances, we do not republish shoots and weddings that have already appeared on the following local blogs: Confetti Daydreams, Wedding Friends, Mooi Troues, Pink Book, Lovilee, Troukoors, Hooray Weddings. We do, however, welcome features that have already appeared in print publications, and that have been published on international blogs – please let us know if this is the case, so that we can ensure that the first publication’s exclusivity period is respected. 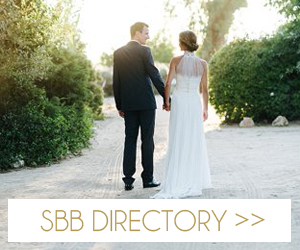 Please note: once a wedding or shoot has featured on SBB, we ask that you wait at least 30 days before submitting it elsewhere. NB: If you have already submitted a feature to another local blog, please wait until their consideration period is finished before submitting to us. If accepted by SBB, we will require you to withdraw the original submission (unless it has already been rejected). How long will it take before I know if my submission is successful? How long will it take before a feature is published? This depends on the nature of the feature as well as our editorial schedule. We try to publish all real weddings within 2 months after receiving all images and information. If your submission is time-sensitive, please contact us at [email protected] to discuss. We will inform you when your blog post is scheduled. What are your image specifications? Images should be sized to 1500px across minimum (a little larger is okay too, if you prefer, but the total folder size shouldn’t be larger than ~120MB). SouthBound Bride is a South African wedding blog, so we only accept real weddings that have taken place in South Africa or neighbouring countries, such as Namibia, Zimbabwe or Mozambique. To submit, click on the button below and fill in the form, including a link to the photographer’s blog post or a selection of images via Dropbox, Pixieset or similar (please note we do not accept WeTransfer submissions) to give us an idea of the wedding’s style. Please ensure that you include decor & details! If your submission is successful, we’ll send the couple a few questions about their big day, and request their list of suppliers. We love receiving styled shoot submissions, and accept features from anywhere in the world. Priority is given to shoots which offer the widest range of inspiration, i.e. fashion, decor, cake, stationery, etc. We cannot guarantee publication without seeing final images, but if you would like to discuss an upcoming shoot idea with us, please get in touch! To submit, click on the button below and fill in the form with a link to a selection of images via Dropbox, Pixieset or similar (please note we do not accept WeTransfer submissions), as well as full information about the suppliers involved. PLEASE ENSURE YOU INCLUDE ALL SUPPLIERS IN YOUR SUBMISSION to avoid having to update the post after publication. While we do accept shoots/features in these categories, we give priority to real weddings and styled shoots. However, if your feature has extraordinary elements such as styling, location, or an amazing story, we’d love to hear from you!